Below are some useful tips for troubleshooting terminal connectivity. If error above appears, do check that the terminal configuration is setup properly. 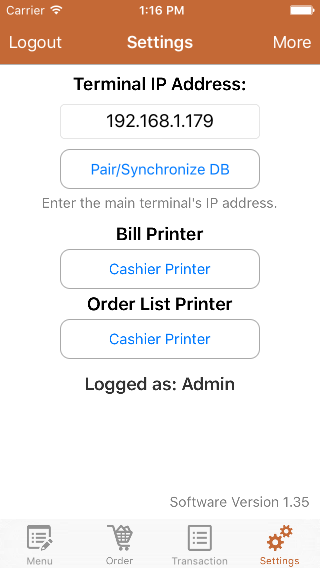 1) Under the main POS terminal settings, make sure "Enable Multiple Terminal Ordering" is switched on. 2) Make sure "Work Mode" is set to "Main POS". The IP address shown below is the IP address of this device. All terminal who wish to synchronize has to enter this IP Address in their device terminal settings. Please refer to screenshot below. If you are unable to see settings above, you might have do an in-app purchase to enable multiple terminal ordering. For terminal, key in the IP address accordingly. "I am having unstable connection, especially during busy hour." During busy hour, interference might be higher. 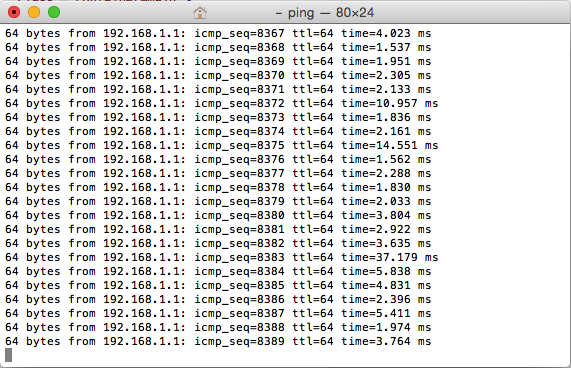 To check if it's the network that is causing the slow down, you can do a "ping" test. You will require a Mac or PC to do "ping" test. 1) Click on the search icon (magnifying glass) on your desktop and type "cmd" into the search bar. 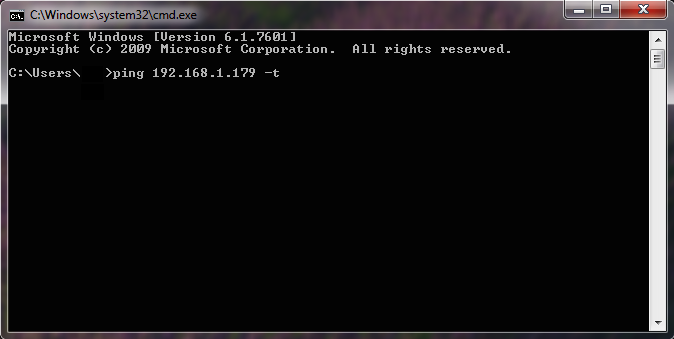 2) Select "Command Prompt" app. 3) A black terminal box will appear. 4) Type "ping 192.168.1.179 -t" and click enter. 1) Click on the magnifying glass located at right top of your screen. 2) Type "terminal" into the search bar. 4) Type "ping 192.168.1.179" and click enter. 5) Click and hold "CTRL C" to stop. In this example, our main POS IP address is 192.168.1.179. Replace that IP address with your own. Upon clicking enter, terminal will attempt to establish connection between your PC and the iPad. Time taken to establish a connection will be shown beside. Monitor it for a period of time as the signal quality might fluctuate. See below for example of good & bad network connection. This is a representation of good network connection. Connection is stable and all ping time is below 200ms. Although ping is below 200ms, do notice that there's some drop of connection at the beginning. This will give you "Unable To Connect" error occasionally. In this scenario, there's no drop of connection. Regardless, the ping is above 200ms and some of it is as high as 1200ms. Terminal will require longer time to send orders. If ping is higher than this, timeout error might occur. 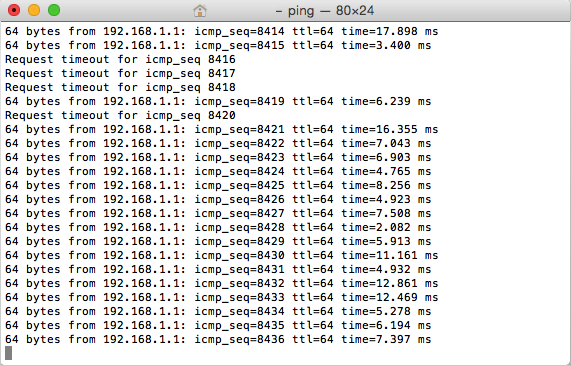 For confirmation, you should also try to ping your terminal. 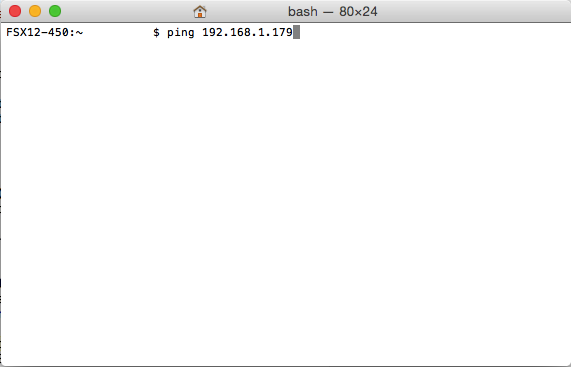 To find out the IP address of your terminal. 1) Exit MobiPos app, navigate to device settings. 3) Click on the blue info button beside the network name. 4) IP address can be found here. If your terminal is not stationary, connection might be more unstable. Try to ping your terminal and move your terminal around. You should notice the further you go, the time taken to establish a connection will be longer. You might end up getting disconnected as well. 1) Place your router somewhere high up. 2) Preferably to have line of sight between your device and the router. 3) Change to a better router. If you have many devices connected to the router, lower quality router might not be able to handle that well. 4) Change your Wi-Fi channel. 5) Update your router firmware. 6) Perform a master reset on your router. 7) Reboot your router. If rebooting the router helps and your are performing it too often, it shows that the router is capable enough. The more transaction you store in device, the longer time it will be required for synchronization. If your network ping is high similar to "ping test 3", it will take a long time to complete the process. Synchronization requires a constant and quick connection. 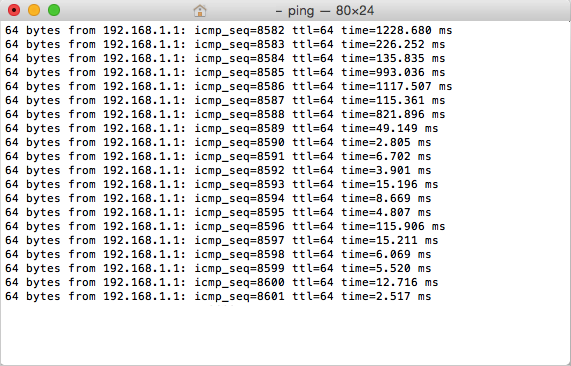 Drop of connection similar to "ping test 2", will fail this process. Retrieving transaction, sending orders and all other terminal activity depend on your network latency. However having too many transactions in your device will cause your query to be sluggish as well. If you have more than 30000 transactions, you should consider archiving your data. Having good internet speed doesn't guarantee you a good local area network connection. In fact, local area network connection has nothing to do with your internet speed. MobiPOS works without internet, communication between devices is within your local area network. Local area network rely solely on the router. We would not be able to recommend you which router to buy. Usually the more expensive the router, the better it is. However do read up reviews online and make comparison, buy the one that suits your need. Ensure that it is the router that is failing you before purchasing a new one. 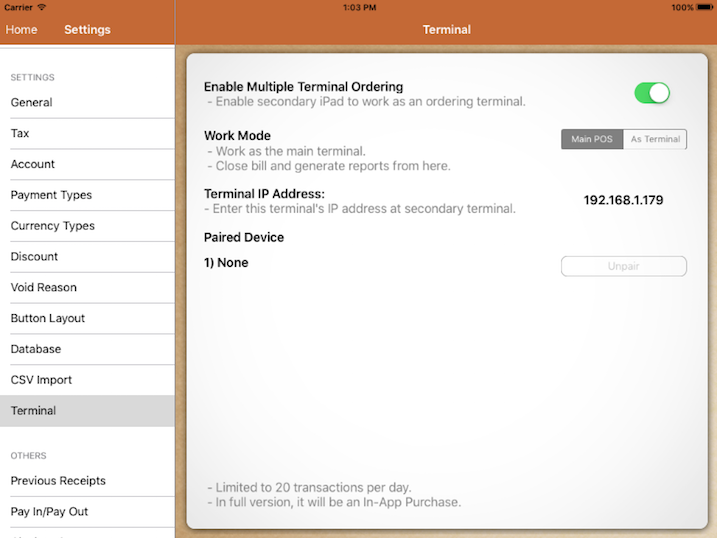 Terminal and main POS must run on the same app version. Synchronization is not possible if both is running different version. For iPad, you can find the version number at login page. For iPhone, it is under settings. With v1.350, device is required to run on iOS6 and above. Else, they will not receive the app update.